One of the smartest moves we can make to protect ourselves online is to use a password manager. It’s one of the easiest too. We’ll help you find the best password manager for you. 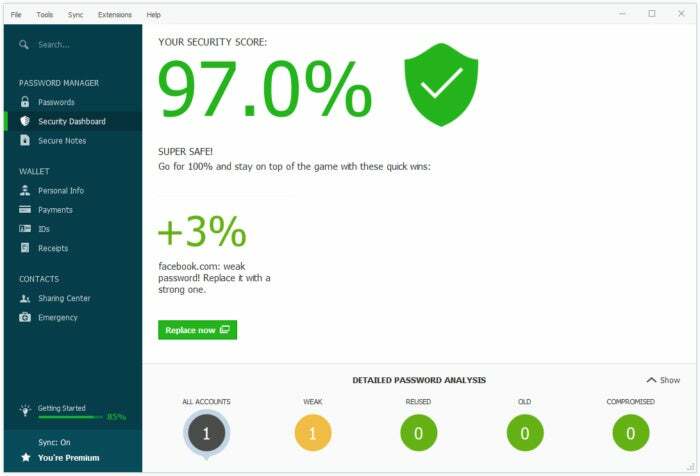 A password manager is an excellent first step in securing your online identity, helping you increase the strength of the passwords that protect your online accounts because it will remember those passwords for you. A password manager will generate a unique strong password for every account and application, without requiring you to memorize or write down these random strings of characters. These strong passwords help shield against traditional password attacks such as dictionary, rainbow tables, or brute-force attacks. Many password managers allow you to automatically populate your password vault by capturing your web logins using a browser plug-in and allowing you to store these credentials. Other options for populating your password database include importing an Excel spreadsheet or manually entering your login information. Further, using these stored credentials is typically automated using a browser plug-in, which recognizes the website’s username and password fields, then populates these fields with the appropriate login information. Although several browsers offer similar functionality out of the box, the best password managers typically offer several benefits over the built-in browser functionality—including encryption, cross-platform and cross-browser synchronization, mobile device support, secure sharing of credentials, and support for multifactor authentication. In some cases, usernames and passwords must be copied from the password manager into the browser, reducing the ease of use but increasing the level of security by requiring entry of the master password before accessing stored login information. Some top password managers store your credentials locally, while others rely on cloud services for storage and synchronization, and still others take a hybrid approach. Some of the options using local storage (such as KeePass and 1Password) still support synchronization through Dropbox or other storage services. 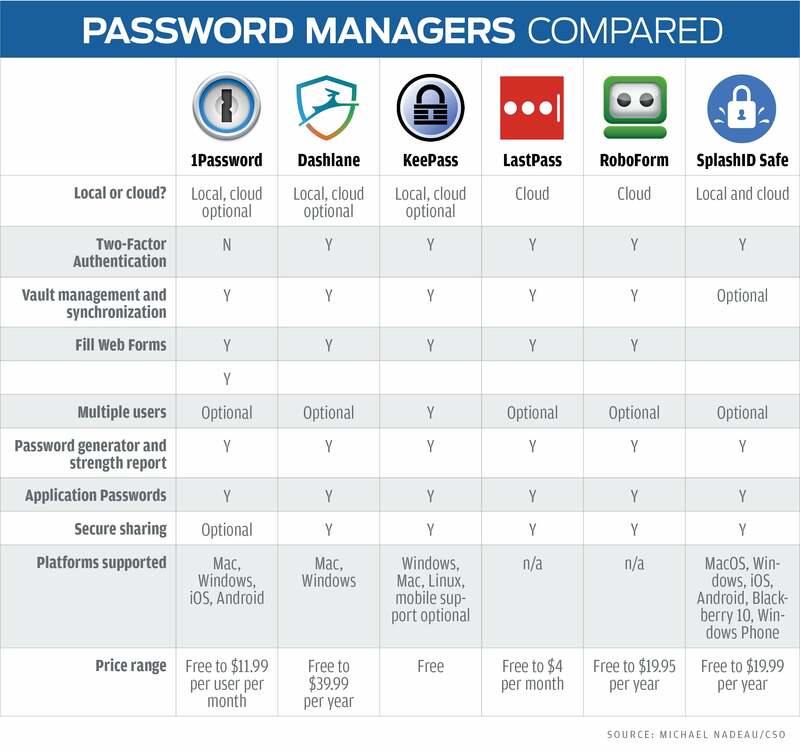 Deciding which password manager is best for you will come down to features and ease of use, as well as to whether you’re comfortable using a cloud-based password manager that stores your passwords on the Internet. If having your critical data stored in a cloud service worries you, then KeePass, 1Password, and SplashID Safe (sans SplashID’s cloud service) are the best options. If you trust cloud-based services with your passwords and you believe they will protect your data using good security practices and encryption, then Dashlane and LastPass are the top choices. In my judgment, KeePass is the best of the options using local storage. KeePass is free open source, and with the right combination of plug-ins, it can be made to do almost anything you could require of a password manager. Among the cloud options, I’m split: I like LastPass for its low cost and its consistent implementation of features across all of the clients, but I prefer Dashlane’s approach to securing passwords. Each LastPass client I tested was easy to work with, stable, and remarkably uniform from a usability perspective. Plus, a LastPass Premium account costs all of $1 per month, making it an extremely compelling option. But Dashlane takes password security a few steps further, most notably by limiting its web app to a read-only version of your password vault, and only decrypting your data within your local browser session, not on the server. In a nutshell, go with LastPass for maximum ease and features at the lowest price; go with Dashlane for maximum password security. Two products offer a middle path that may appeal to some users. 1Password and SplashID Safe combine the security benefits of offline vault storage with the convenience of full synchronization through an online service. With either of these password managers, you can choose to synchronize most of your credentials using the cloud service while selectively opting to store certain information offline or to synchronize through an alternative such as Dropbox. Really, you can’t go wrong with any of these password managers. Along with the six full-featured options I focus on below, there are even a few other tools you might consider. 1Password is the brainchild of AgileBits, a long-time developer on MacOS, though 1Password runs on multiple platforms including Mac, Windows, iOS, and Android. 1Password has long supported the use of a local file to store encrypted passwords, and now offers synchronization, monitoring, and other benefits through an optional cloud service. 1Password also supports synchronization of password vaults using Dropbox (all platforms) or iCloud (MacOS and iOS only). If you would prefer not to use the cloud for password synchronization, 1Password can synchronize password vaults across Windows, MacOS, iOS, and Android clients directly via Wi-Fi. Because a 1Password vault is contained in a single file, you are able to control how individual vaults, and therefore passwords, are managed. A downside to vault management with a 1Password account is that new vaults can be created only through the web app, which caused some confusion for me in testing. For those who want to share passwords securely, 1Password offers team and family accounts that allow you to selectively share password vaults with other members, and even control which members can make changes to passwords. 1Password also allows you to use the team or family account’s secure storage to share sensitive documents among members. Each member has the ability to create and manage their own password vaults and accounts in addition to gaining access to shared vaults. Unfortunately, sharing vaults is limited to family or team accounts. You can’t simply share with another individual with a 1Password account. 1Password offers a clean UI and a number of ways to navigate your credentials. 1Password provides a number of different tools that analyze your passwords and the services they secure in order to identify potential vulnerabilities. The 1Password Watchtower service keeps track of compromised websites and services that could impact your personal security, and alerts you to change your passwords or to be on the lookout for potential problems. Tools like Security Audit can help you identify weak passwords in order to strengthen your critical accounts. The security features behind 1Password include the use of a secret key, which is a random string of characters generated when you initially create your 1Password account. This security key, which is not recoverable by 1Password, is used to secure your account and each client. 1Password does offer the ability to easily authenticate a new client using a QR code. Unfortunately, 1Password does not support multifactor authentication other than the use of registered devices. Both the iOS and Android clients support authentication using the fingerprint reader on your device. You have several different options for getting started using 1Password. Each of the 1Password clients for Windows, MacOS, iOS, and Android are free. An account is required only if you are going to use the 1Password service for synchronization. For business users, 1Password Standard and 1Password Pro cost $3.99 and $11.99 per user per month respectively. 1Password and 1Password Families cost $2.99 and $4.99 per user per month. Dashlane is another password manager that toes the line between cloud service and local password manager in an attempt to answer every security concern. You can store your password database on Dashlane’s servers and take advantage of synchronization across devices, or you can store your password vault locally and forgo synchronization. It’s your choice. 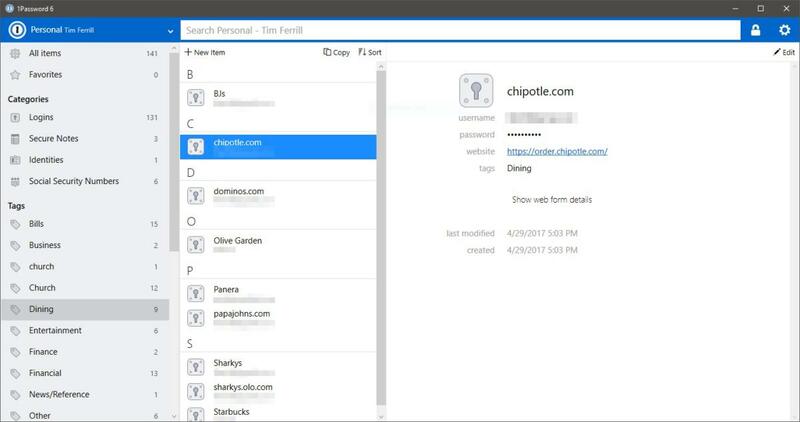 If you store your password database in Dashlane’s cloud, your master password remains with you only (much like 1Password, only Dashlane was doing it first). Rather than storing a hash of the master password on its servers, Dashlane only uses your password to encrypt and decrypt the data on your local device. Authentication is performed against devices that are registered with Dashlane through a two-step process, incorporating your master password and a device registration code sent via email. Two pricing tiers are offered for Dashlane users. A free account allows access to your passwords through a single device of your choice. Premium accounts, which cost $39.99 per year, let you synchronize your passwords across multiple devices, perform account backups, share more than five items, give you access to the web app, and entitle you to Dashlane’s customer support. Dashlane will store your password database in the cloud, but your master password remains with you only. (Don’t lose it!) Like other password managers, Dashlane will assess the strength of your password as you create it. With Dashlane, your retention of your master password is an absolute must. The company states that it is unable to perform password recovery in the event of loss, a necessary side effect of its decision not to store a copy of your password in any form. Two-factor authentication is supported through the use of U2F (Universal 2nd Factor), such as a Yubico Yubikey. Support for two-factor authentication must be enabled through the Windows or Mac client and can only be used on clients with a live Internet connection. Dashlane’s team features allow you to securely share login information with other Dashlane users. Shared items can be provided with limited rights, which restrict the ability to change permissions or reshare an item, or with full rights to the data. Dashlane also offers the ability to designate emergency contacts, making it easy to allow family or co-workers access to critical accounts or information in the event of an emergency. The data shared with an emergency contact can be fine-tuned in order to provide only certain information to specific contacts. Dashlane’s architecture makes it an excellent option for users who want the convenience of a cloud-based solution without the fear of potential service breaches. Of course, while the precautions Dashlane takes to safeguard your data eliminate the risk involved with storing information online, they may not protect you from other attack vectors. A mature open source project (GNU GPL version 2), KeePass is a free password management solution for Windows, MacOS, and Linux, running natively on Windows and requiring Mono or Wine for the other platforms. Many of the benefits of open source software are prevalent in KeePass, including ports to other client operating systems, comprehensive language support, and a robust plug-in ecosystem. With the extensibility offered by plug-ins for KeePass, you can change the encryption algorithm, automate logins through your browser, integrate an on-screen keyboard, and even create scripts you can run against the password manager. KeePass was designed to store a local copy of the password vault. Cloud backup and support for synchronization across multiple devices are obtained through plug-ins that work with the likes of Dropbox, Google Docs, Microsoft OneDrive, or even your own FTP server. A side benefit of a local password database such as KeyPass is the ability for multiple users to share a database or for one user to keep multiple databases, sharing some and keeping others private. With KeePass, you can lock your password vault using a combination of password, key file, and Windows authentication. Mobile support for KeePass is more obtuse than for the commercial options. Ports are available for iOS, Android, and Windows Phone, but the big question becomes synchronization support. Not all mobile ports support cloud synchronization, and those that do support only a subset of the cloud options. Some mobile KeePass clients carry a cost, though most are in the $1 to $2 range. Note that a couple of web-based KeePass clients allow you to work with a key database stored on your local hard drive or a cloud storage account. KeeWeb is particularly sleek, and it’s available in native Windows, MacOS, and Linux versions as well. Like KeePass, KeeWeb is itself open source. If you’re more concerned about the security of your password vault than mobile clients and device synchronization, you’ll be pleased to know that KeePass supports multiple authentication methods by default. KeePass database files can be locked by a combination of password, key file, and Windows user account. With a key file stored on removable media such as a USB thumb drive, two-factor authentication can be used to secure access to your critical passwords. The biggest downside to KeePass is complexity. Getting all of the advanced functionality offered by the competition will require quite a bit of research, setup, and maintenance. Heck, you even have several options for multifactor authentication, but you’re largely on your own to get it working. While KeePass is a great solution for fans of free open source and maximum flexibility, it is certainly not as straightforward as some of the cloud-based services and hybrid solutions listed here. October 25, 2017 admin Comments Off on iTunes 12.7: Can you really delete iOS apps stored by iTunes?